A native of Overbrook, Kansas, Virginia was born to Earl & Zetha Huston in Ottawa, Kansas on September 27, 1936. She graduated from Appanoose High School then attended and graduated Business College where she subsequently held positions as an Administrative Assistant in various industries (USAF, Toledo University, IMA, Hedrick Medical Center). Virginia was an avid bowler, winning many tournaments; she also enjoyed dancing, reading, and crocheting. Virginia will be lovingly remembered by her children, Rick Gibson, Robert Gibson (Sherry), Sunny Gunnoe-Lunnen (Tom), and Kay Gunnoe. Virginia will also be fondly remembered by her four grandchildren (Stephanie, Elizabeth, Courtney, and Halli) and five great-grandchildren (Hali, Alex, Brayden, Easton, and Wyatt). 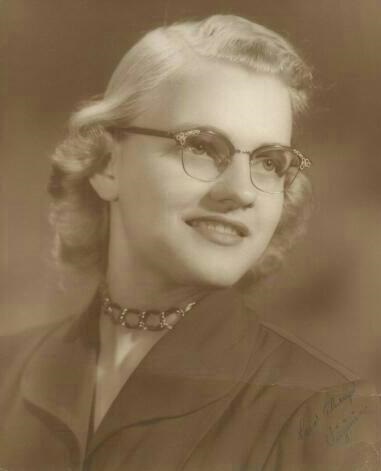 Virginia was predeceased by her brothers, Howard Huston & Kenneth Huston, and her sister, Wilma Rieck. Interment will occur in the family plot at Appanoose Cemetery in Overbrook, Kansas. Ginny (as I knew her) was a wonderful, vibrant, full of love, life, and kindness. We not only worked together but were long time friends outside the office including bowling together. So many great memories and experiences that true friends make and hold onto. Ginny will be missed and my sympathies to her family at this sad time. She is in a better place and pain free watching us with her wonderful smile. My sincere condolences to Virginia’s family and friends. I hope you can celebrate her life and everlasting memory at this difficult time. I have the pleasure of knowing her beautiful daughter Kay and I expect Virginia shall be at peace in the prayers of a loving family. God bless you as you are in my thoughts. Sunny, Tom & Family, hoping that you will find peace and comfort in each other during this difficult time. Will have you all in my thoughts & prayers. Deepest condolences to my friend Sunny and her family. While I never met Virginia in person, I got to know her through Sunny and our several talks these last few years, a wonderful mom and lady, she is in a better place now. Hugs to my friend Sunny for support! Sunny, thinking of you and your family during this most difficult time. I hope you find peace and comfort in the coming days. Big hugs!! !